@FL please change the 1/4 mile time of audi r8 gt to 11.5 sec @ 125.1 mph. As far as i know no Magazine has ever recorded that numbers, Now if its a privately owned one at the strip, I can certainly believe it. If no problem adding that time like that, But i would like to see proof, But as far as i know, No mag or independent has recorded that time. I think i have an idea who put that time though, But still would like some proof. Here is why the ¼ mile time doesn’t look right. As for right now, they say the car took 7.3 seconds to reach 100mph (which is 161 km/hr). Based on the published number on this site, it takes the car 2.5 seconds to go from 161 km/hr to 180 km/hr, however only 1 second to go from 180km/hr to 200 km/hr. Given that the car is an R-tronic even if it were to change gears between 161-180, there is no way to explain how a 2.5 second time goes down to 1 second at a higher speed. Going from 180 km/hr to 200 km/hr in one second is unheard of in a naturally aspirated production car. It was me because SpongeBob and Patrick were too lazy to go to school. Now who changed it again? This cars 1/4 mile keeps changing like every month, 11.9-11.8-11.6-11.5-11.3-11.2-11.1, Know 10.9?...Cmon, I believe its capable of that, But i would like to see something varifiable. Umm...11.3 is definetly possible, even faster, and would even vary more with a manual with a Pro,but not faster then a ZR1, in a straight this is a fast as a LP560-4. could be even faster IMO. The R8 GT is an awesome car, but 11.3 seconds 1/4 mile, no way, that's quicker than the Corvette C6 ZR1, 11.7 seconds at 133 MPH. The ZR1 has 113 more horsepower and is 11 pounds lighter. Why it seems to you that 1/4 time is impossible, whether V10 5.2 FSI did it only 0.2 sec slower? ...What source did that 1/4 mile come from? Not that i dont believe it. More stuff for the Audi R8 GT. I add more performance figures for the Audi R8 GT. The launch control isn't that precise so that the slip ratio of the tires is mostly too high and the acceleration becomes slower. Go Audi, Lamborghini and Porsche and make the best sports cars! I am confused. Why none carmags has getting better result for the acceleration 0-100km/h? 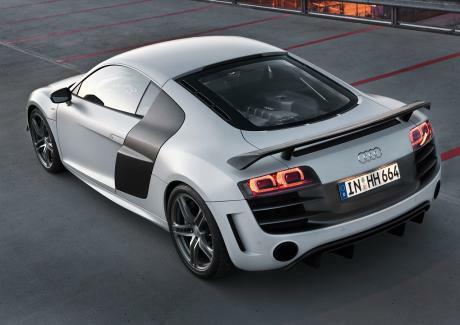 Because best time what R8 V10 hits 0-100km/h is 3.7 seconds. 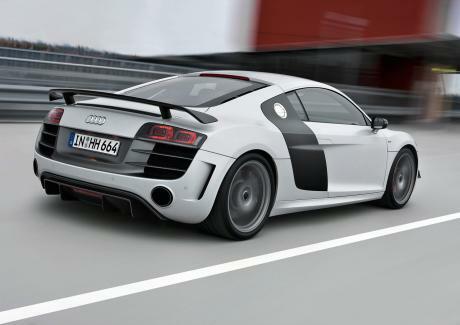 R8 GT has to be hits 0-100km/h at least 3.4 seconds. Actually the R-Tronic changes gear about as fast as a double-clutch, but very harshly, it isn't very smooth. 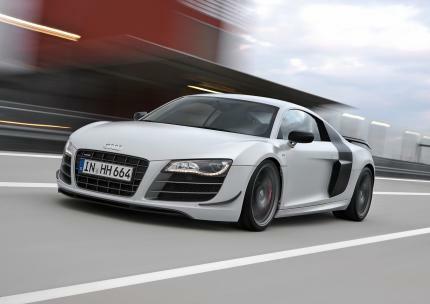 first of all , the R8 need a double cloutch gearbox and not this crap wich changes gears in 0.3 sec instead of 0.01 sec. Well according to this the time is about 29 seconds to 177mph! 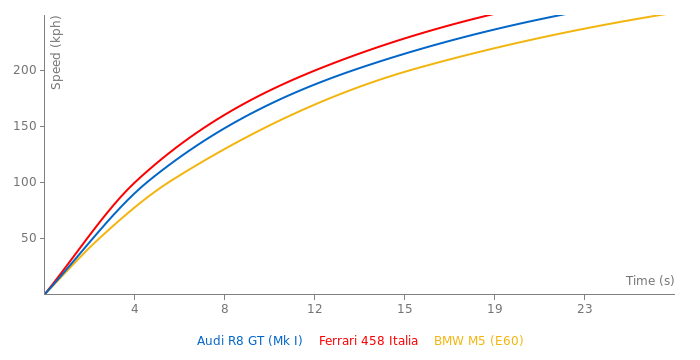 It would be a close race but I still think the R8's much higher power/weight will win over to 300 kph, barely. I'm with u Woody, i also think that the GT-R mk III can beat the R8 GT to 300km/h. @Smugolo: well 10:889 on video with Best Motoring... close enough. If Nissan says it can do 10:8 i believe them. The GT-R Mk.3 hasn't yet achieved its claimed 10.8 s quarter mile. So far the best time is 10.889 from Best Motor TV. Also the trap speed on the GT-R Mk.3's page is wrong. That speed was measured in C&D test, but that was 11.2s 1/4 mile. So it doesn't do 10.8 0-200 kph either. Although it might in the future. Anyway, I hope someone fixes that page quickly. The GT-R does 0-200 kph in 11.1, the R8 GT in 10.8, as I said before the R8 will catch the GT-R at higher speeds due to the GT-R's early acceleration gearing. Although the R8 GT is in a different price and class range then the GT-R.